"Everyone thinks we are twins. But we are not twins", the two brothers, who bear an uncanny resemblance to each other, emphasize. Pedi and Paul Mirdamadi are successful fitness models and competitors: well-toned, muscular, handsome. In this thrilling video of Strong-Athlete.com the boys hook up for a pre-contest arm workout. They open up with three heavy supersets of straight barbell curls and weighted dips. For the second round they isolate the triceps with three sets of overhead rope extensions and hit the biceps brachialis with three sets of rope hammer curls. Three supersets of single-arm cable extensions and cable curls are added for the third round to etch in a little extra detail. And they finish the session off with an old-school favorite: barbell curl 21′s and close grip push-ups. Pedi and Paul get an amazing arm pump from this workout and strike a few of their signature poses for the camera. The passengers of the plane get to see a handsome muscle man in peak form. 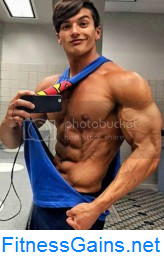 Fitness model Adam A. flexes and shows off his muscle gains and high definition for many new photos and videos published on AllAmericanGuys. You find numerous high quality photos and videos of Adam A. here on AAG. The ripped, young man is well on his way to becoming a big bodybuilder. His physiqual development is amazing, his fans are enthusiastic. 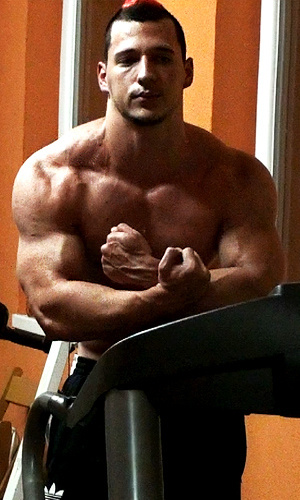 Now David Dancs, 19 years old and from Hungary, wants to win on stage. He prepares for competing, and works his chest in this video. Heavy weights, much strength, and mutual motivation: 23-year-old Australian bodybuilder Denver Steyn and his buddy Mario Silvestri join for a comprehensive training that pumps up and sculpts the entire body, and is highly thrilling. "Time to murder arms! These workouts are sure to get you huge biceps and triceps", Justin Wolterin announces powerfully. In this video the 26-year-old fitness model works his arms with various exercises. 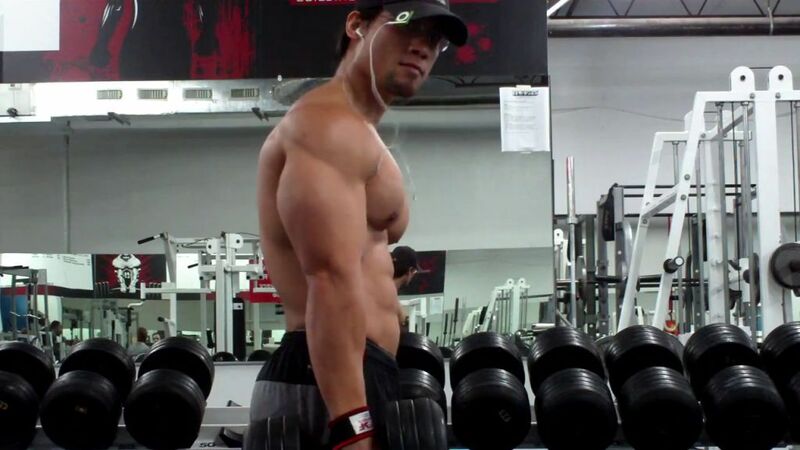 Justin's advice regarding muscle gains: "Big weight and controlled negatives". All fits together perfectly here: The physique, the face, the charisma. Phil Fusco shows again why he is one of the most popular fitness models, and displays his extremely well-toned and perfectly shaped body on numerous new shots on AllAmericanGuys. You find many high quality photos and videos of Phil Fusco here on AllAmericanGuys. Heavy chains and weights, much strength and precise performance - That's what fitness cover model Justin Woltering needs to blast his chest. In this video the 26-year-old bodybuilder demonstrates a routine that builds chest muscle in four steps. When he takes off his shirt, his workout progress becomes evident. AAG model Cody C. is even more ripped on his new shots. You find all his high quality photos and videos here on AllAmericanGuys. Massive, well-defined, and perfectly proportioned: Bodybuilder and powerlifter Tuan Tran knows how to sculpt each of his muscle groups. This time he works back and traps with a special training, the Dumb Bell Complex, consisting of three exercises: Upright Row, Side High Row, and Shugs. A physique well-toned to the utmost, an exceptionally handsome and expressive face, a great charisma: Phil Fusco is a big star in the fitness modeling scene, ripped and smart, and now back on AllAmericanGuys with new thrilling photos and videos where he is posing in natural surroundings, on the beach and in the studio, and armwrestling with Anthony C.
You find all his new high quality photos and videos here on AllAmericanGuys. 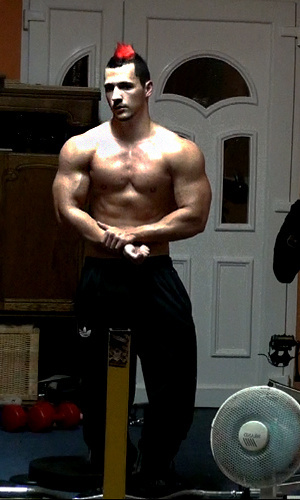 The GregPlitt.com Members Section contains 147 videos, including 43 instructional workout videos, and is updated weekly. $9.95 a month for full access.